Tile Cleaners Sydney® prides itself on providing Australia's best terracotta stripping and sealing service. Our years of experience in the field of tile protection results in your terracotta looking its absolute best, protected against staining and deterioration for the longest time possible. Terracotta tiles are quite porous and should be sealed to preserve their beauty and protect against staining and deterioration caused by everyday wear. Sealed or not sealed, we can help; our team of tile care professionals will achieve the best results for your terracotta tiles. When your terracotta tiles begin to appear dull and start to stain easily, that means your previous sealer is wearing off and your terracotta tiles are in danger of permanent damage. Tile Cleaners Sydney® strip/remove all necessary worn sealer from your terracotta tiles, restoring their fresh look using our advanced, proven machinery; we then seal your terracotta tiles with one of our top quality water based products. 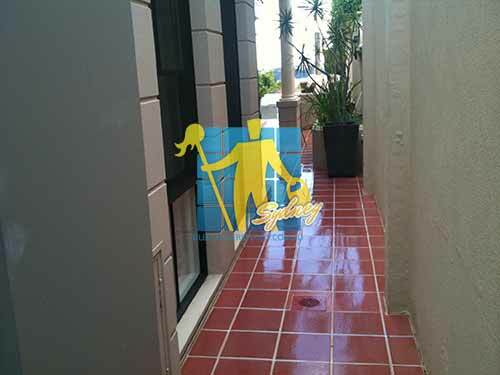 Tile Cleaners Sydney® are proud to be accredited applicators of Deepshield® high quality advanced penetrating sealers. Don't be caught faced with ordinary looking surfaces for the long-term in your home. Deepshield® offers long term benefits and peace of mind. Whether you decide to seal your terracotta tiles using a Clear Impregnating Penetrating Sealer, a Colour Enhancing Penetrating Sealer that enriches the colour and texture of your stone or a high quality Topical Gloss/Satin/Matte Finish Sealer, you can rest assured your terracotta tiles are receiving the best possible protection and care. No matter where your terracotta tiles are, Tile Cleaners Sydney® will strip, clean and professionally reseal them for you. In your kitchen, shower, bathroom, around the swimming pool, your backyard, outdoors or any hard to reach indoor areas. Tile Cleaners Sydney® are experts in terracotta tile cleaning, stripping and resealing, with our client base varying from the largest shopping centres to schools, hospitals, clinics, small to large offices, home owners, and various other businesses, you can rest assured that you are receiving the country's highest quality service. Our thorough cleaning processes combined with the highest quality products and equipment achieve the best and freshest looking terracotta tiles, protected and preserved against staining for the longest possible time. Give us a call, we are happy to help you with all your terracotta tile enquiries, or simply enquire with us online and we will call you back as soon as we can. Call now for a free quote and find out which service suits you. Tile Cleaners Sydney® guarantee your satisfaction with our professional services. You can call us any time, we provide our tile cleaning service after hours for your convenience. Terracotta is a ceramic material that has been used for construction and decorative arts since ancient times in many cultures around the world. Terracotta, which literally means "baked earth" is made from natural clay which gives its characteristic reddish-brown colour. Glazing provides extra durability or can provide extra colour, ranging from natural earth tones such as grey and brownish yellow to various shades of red. Terracotta is waterproof when glazed and a very sturdy material. 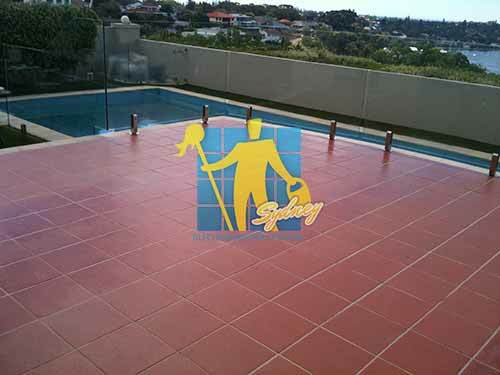 Tile Cleaners Sydney® recommend penetrating sealers for terracotta whenever possible. Penetrating sealers are designed to maintain the natural look and feel of your terracotta. 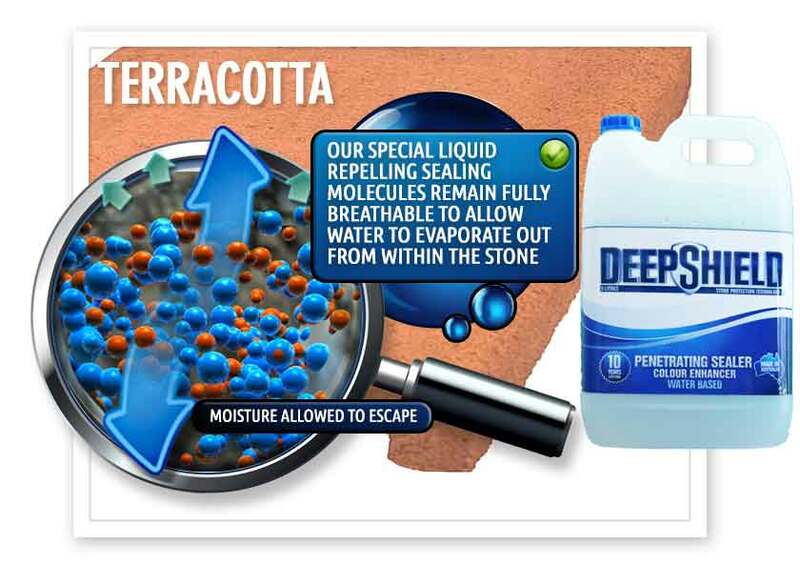 Deep penetrating impregnating sealers use nano-technology to protect your terracotta and grout from water and oil based stains by chemically reacting with the surface pores to form a long lasting breathable protective barrier. An impregnating sealer protects your terracotta surface and grout from absorbing stains and results in cleaning and maintenance becoming much easier. 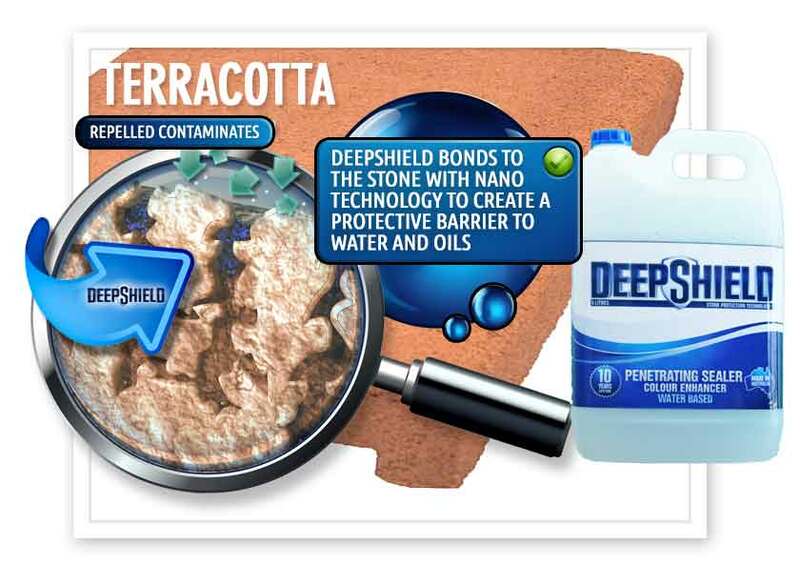 Australia's Deepshield® range of impregnating water based sealers offer long term benefits, protecting for up to 15 years depending on the product type. An impregnating transparent sealer enters the pores of your stone and once cured will not change the look of the tile or stone. A penetrating colour enhancing sealer is designed to enhance and enrich the look of terracotta tiles. Penetrating sealers however will not result in a shine or a gloss finish as they do not leave a surface coating. If you would like a shine on your terracotta you will need to to use a topical sealer. Tile Cleaners Sydney® are experts at applying all types of sealer and will ensure your terracotta looks its absolute best. Tile Cleaners Sydney® experienced technicians can apply a topical sealer when especially required to create a high gloss, satin sheen or matte finish to your surfaces. Topical sealer is also helpful in situations where the old solvent based sealer can not be completely removed or when required to hide certain types of damage. Topical sealer's have a life expectancy of 3-5 years. You can easily test how porous your terracotta is by applying a small amount of water to the surface and watching how it is absorbed. You can then see how any type of water based stain can be absorbed by the terracotta tile surface and grout. Does your service include stripping solvent sealers? Tile Cleaners Sydney® standard service does not include stripping solvent coatings and we do not recommend stripping solvent sealers unless it is absolutely necessary. When no other option is available this service is provided, however due to the high cost of products and time required only at an additional cost. Can I use a penetrating sealer if my terracotta has a solvent coating? The short answer is no, as the remaining coating will prevent the penetrating sealer from penetrating into the terracotta surface pores. You can only use a penetrating sealer once the previously applied solvent coating has been fully removed, however, this can be extremely costly. Alternatively, it is recommended to reapply a topical sealer once the surface has been treated using a solvent-free stripper to thin out the old coating, preparing the terracotta for a fresh seal. This will help avoid the costs and inconvenience caused by stripping solvent sealer. also depend on whether they are indoors or outdoors as most sealer's will not last long outside due to being designed for internal use. If your terracotta is outdoors, it is important to use a water based sealer that is specifically designed for outdoor terracotta. There are two types of impregnating clear sealer, water based sealer & solvent based. In the past solvent based sealers were more widely used as they used to absorb deeper into the terracotta and grout and would also last longer. Today however, thanks to new technological advancements, it is recommended only to use water based sealer's, that last much longer and cause less potential damage to health and property. Solvent based products are more difficult to apply and can create major problems when applied incorrectly as they are very hard to remove. 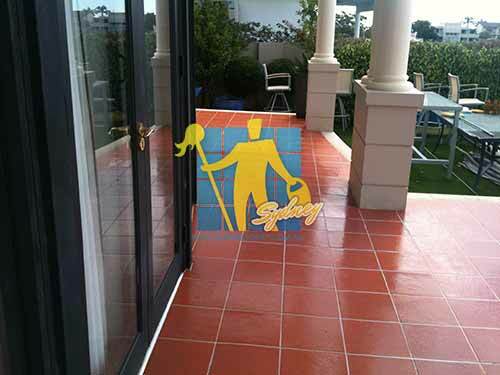 Tile Cleaners Sydney® recommend our clients apply a long lasting water based sealer such as a quality product from Australia's Deepshield® range of sealer's to their terracotta tiles and grout. Topical sealer's (glossy plastic coating over the top of the terracotta) are still used on terracotta, but these older style sealer's can trap moisture in the stone and make the surface slippery when wet. When a topical sealer wears in higher traffic areas, the entire surface usually needs to be stripped and re-sealed. 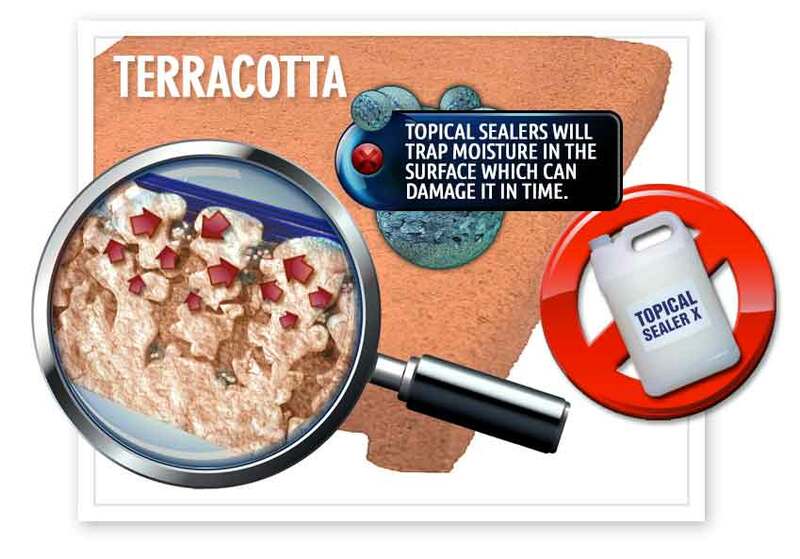 To provide the best possible protection from oil and water-based stains; to maintain the look and slip resistance of your terracotta and to prevent damaging moisture from being trapped within the stone, it is recommended to seal your terracotta with a high quality, transparent, fully breathable impregnating sealer. Solvent stripping is only required in extreme cases, for example when efflorescence or dirt beneath the old solvent sealer needs to be removed. The toxic fumes from solvents can be dangerous to health and property, and the area must be vacated for 48 hours. Solvents damage skirting boards, doors, paint and adjacent areas. A signed “Liability Waiver” is required when any solvent stripping is carried out. Q: How do I know when my terracotta floors are ready for cleaning, stripping and resealing? Q: Is it safe to have terracotta tiles stripped and sealed? Q: Why do I need to strip my terracotta floors? Q: What is a terracotta tiles strip and seal? Q: Which process can I expect when you arrive to reseal my terracotta floors? Q: How often should I seal my terracotta floors? Q: What happens if I do not seal my terracotta floors? Q: When is the best time to seal my terracotta floors and how do I know that mine need sealing now? Q: Will sealing my terracotta prevent efflorescence? Q: Efflorescence has built up on my terracotta tiles. Can you remove it? Q: What can I do to keep my terracotta tiles looking new? Q: How will you charge me for stripping and sealing my terracotta tiles? Q: How do I measure the size of the terracotta area? Q: What should I do to prepare for the terracotta cleaning?